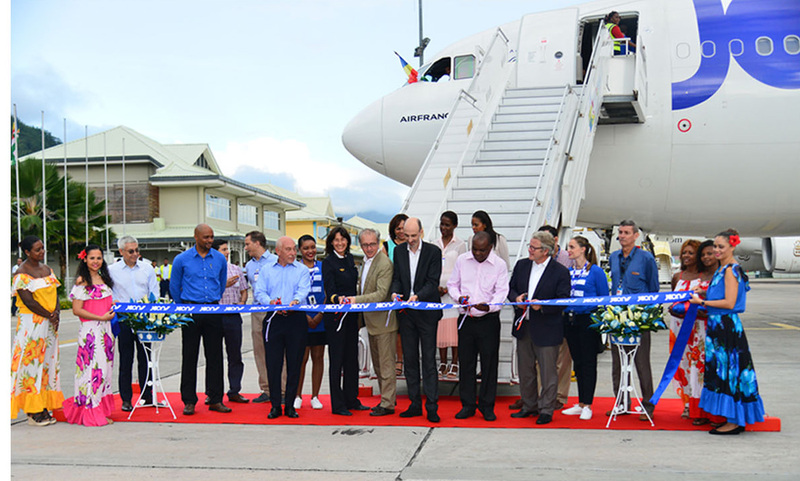 The return of Air France to Seychelles, through its new sister airline 'Joon' was marked by an inaugural ceremony on Tuesday. The airline's Airbus A340, flown by Captain Sophie Bordmann, was greeted by a water canon salute as it touched down at the international airport, shortly after 7am. The Minister for Tourism, Civil Aviation, Ports and Marine, Didier Dogley, Principal Secretary for Tourism, Anne Lafortune, Principal Secretary for Civil Aviation, Ports and Marine, Garry Albert, Chief Executive of the Seychelles Tourism Board, Sherin Francis, as well as high officials of the Seychelles Civil Aviation Authority and Air France were present at the airport. The Minister for Tourism, Civil Aviation, Ports and Marine, Didier Dogley, congratulated the team that has worked to ensure the return of Air France to Seychelles, adding that through Joon, Paris will become a hub that will not only help to grow the French market, but will also help to develop other markets, to further strengthen the tourism industry, which is the mainstay of the country's economy. 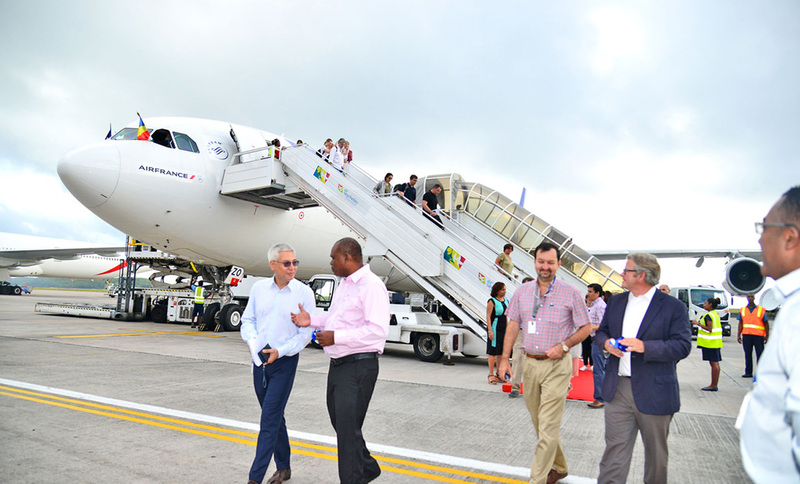 Joon's thrice weekly direct flights linking Seychelles with Paris started on May 5, marking the return of Air France to the island nation after a 22-year absence. "After 20 years, we are very pleased to be back in Seychelles. It is a new step in relations between Seychelles and Air France. With 3 weekly flights towards our hub of Paris Charles de Gaulle, operated by Joon, we propose a wide choice of connections to France and Europe", said Henri Hourcade, Senior Vice President Caribbean Indian Ocean and Latin America - Air France KLM. France that has long been the main tourism market for Seychelles, was surpassed by Germany in 2014 and in 2017. According to the National Bureau of Statistics, France has sent 17,289 visitors to Seychelles so far in 2018, which is one percent above last year's figures for the same period and 415 visitors behind Germany, which maintains the top spot. The Seychelles Tourism Board's Regional Director for Europe, Bernadette Willemin, said: "The arrival of Joon is good news not only for the French market as Air France has a global network, which will allow us to develop other European markets, as well as other markets in North and South America." To note that Joon's thrice weekly flights are replacing the Air Seychelles' flights that used to link Seychelles to Paris, now that the national airline is focusing on its regional network. The new airline, which is targeting the millennials, leaves Paris on Mondays, Wednesdays, and Saturdays. The returning flights are on Tuesdays, Thursdays and Sundays.